Geographical Region: They are found in the eastern panhandle of Florida. Size: Up to 9 inches in length. Habitat: They live on land and in water; marshes and woodlands. Food: Omnivorous, they eat worms, slugs, snails, insects, and plants. Interesting Fact: These turtles are now an endangered species because they were once hunted for food. 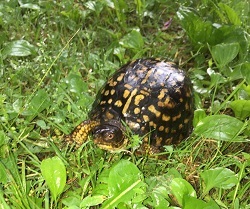 Wood turtles are a species of special concern in West Virginia. Wood turtles have several distinguishing characteristics that make identifying them in the field rather simple. The carapace (top shell) has a central keel running down the middle of the vertebral scutes, and ranges in color from brown to olive green. Each scute has several raised ridges forming concentric circles called annuli. The skin along the front and back legs and first third of the neck ranges in color from orange to red, and gradually changes from these colors to brown to black along the rest of the body. Males and females are sexually dimorphic, which means they look different. Wood turtles are semi-aquatic, and prefer marshes habitats, riparian, wet meadows, and forest edges. Individual home range size ranges from seven to nine acres for females and ten to twelve acres for males. 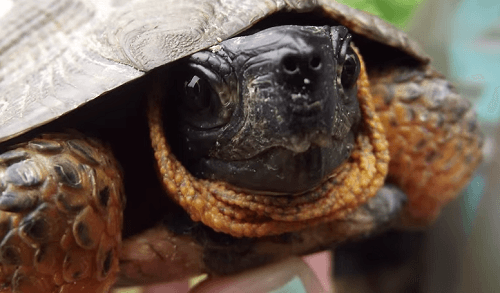 Several studies on wood turtle movements indicate that most wood turtle home ranges are never more than 500 yards from streams, making these habitats crucial for maintaining robust populations. Hibernation occurs in stream beds three feet underground. Within these habitats wood turtles reach population levels of six to ten turtles for every 10 acres of land. When a sizeable worm population is identified by the turtle, they stomp the ground with their front feet in a rhythmic fashion. 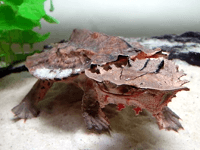 The vibration produced by stomping causes worms to rise to the surface at which point the turtle eats them. Wood turtles usually have a preferred feeding ground within their territories that they use for foraging more than other areas within their home range. 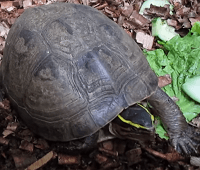 Although the peaks in mating activity occur in the spring and fall, Wood Turtles are known to mate opportunistically throughout their activity period. Males have been observed exhibiting aggressive behavior such as chasing, biting, and butting both during the mating season and at other times. Before they actually touch noses, they lower their heads, and swing them from side to side. Courting adults may produce a very subdued whistle that is rarely heard by researchers. A female may mate with multiple turtles over the course of the courting season. Hatchling and juvenile survival is very low and the time to sexual maturity is long. These characteristics are compensated by adults living a long time and reproducing for many years.